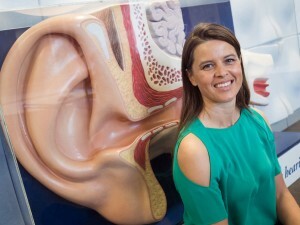 During Hearing Awareness Week (20-26 August 2017), researcher Associate Professor Catherine McMahon, Head of Audiology at Macquarie University’s Australian Hearing Hub, wants companies and employers to be aware that even a moderately noisy working environment, such as an office, could be impacting their employees’ wellbeing. While excessive noise is a leading cause behind hearing loss, with a 2010 Access Economics Report attributing noise as the reason behind 37 per cent of hearing loss cases in Australia, the impact of moderate noise levels on wellbeing and physical health can also be quite severe. “Stress increases cortisol levels which can affect our weight, increase the risk of cardiovascular disease, depression and lead to lower life expectancy. Noise can also reduce our ability to sleep, and due to the need for increased attention to what we are doing – listening to someone speak, reading or writing – we are generally more fatigued by the end of the day. Of course, this can also cause increased effort when thinking, frustration and anxiety,” explains Associate Professor McMahon. “Noise and stress are cumulative – everyone needs a break from noise. So taking a lunch break or going for a walk during the day is a great strategy and is good for your physical and mental health,” she concludes. For further information on Hearing Awareness Week and advice on how to better protect your hearing, please visit this page. There is also an array of hearing clinics on campus, an online hearing test and noise risk calculator available, as well as free hearing checks offered during Hearing Awareness Week at convenient community locations.